How to Make Delicious Jap Chae Korean cuisine .Korea seems indeed once synonymous with serving dishes made ​​noodles such grain in jap chae. If in Indonesia are on the fried noodles fried yellow noodles boiled together with various chopped vegetables, it also has a grain korea jap chae. Jap chae which means a mix of languages ​​hanji is indeed composed of a mixture of pieces of vegetables such as onions, peppers, leaves of chives, carrots, and additional ground beef and suun or dangmyeon. Making this jap chae precision such as fried noodles where suun or dangmyeon boiled until fluffy then drained and further mixed with sauteed vegetables. At the final stage of the frying pan, jap chae is added with seasoning ingredients such as soy sauce, sesame oil, sugar, salt and pepper. And the presentation sprinkled with sesame seeds served with toasted. Here is a full review of the manufacturing steps jap chae of Korean cuisine dish how to make delicious Korean dishes jap chae. Boil suun korea (dangmyeon) until cooked and chapped, then remove and drain. Meanwhile, mince the garlic and cook until issuing a rich aroma. Then add the garlic dish with minced beef. Stir well and wait until the meal is ready. Next, add the back cooking with dried ear of boiled leaves, leaf chives, green pepper, red pepper, carrot, and onion bomba. Toss well. After that, add cooking with suun (dangmyeon) followed with condiments such as soy sauce, sesame oil, sugar, refined salt, white pepper powder and soy sauce. Stir again until evenly cuisine. Remove and serve together complementary sprinkled with sesame seeds toasted. That's the noodle dishes plus vegetable jap chae ala korea. 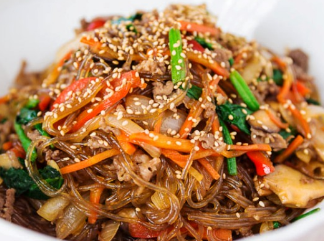 Jap chae Hopefully this recipe will help you in making korean food cooking in the kitchen jap chae your pet. 0 Komentar Untuk "How to Make Delicious Jap Chae Korean cuisine"